Get Ready To Start Your Circus Adventure! We’re thrilled that you’re interested in taking classes with us! Since our start in 2010, we have encouraged our community to come fly with us and discover the empowerment, creative fulfillment, and joy that aerial and circus arts can add to your life. We make our classes as inclusive as possible – there are no weight restrictions or fitness prerequisites to join our circus! If you’ve never tried aerial or circus arts before, these are the classes for you! 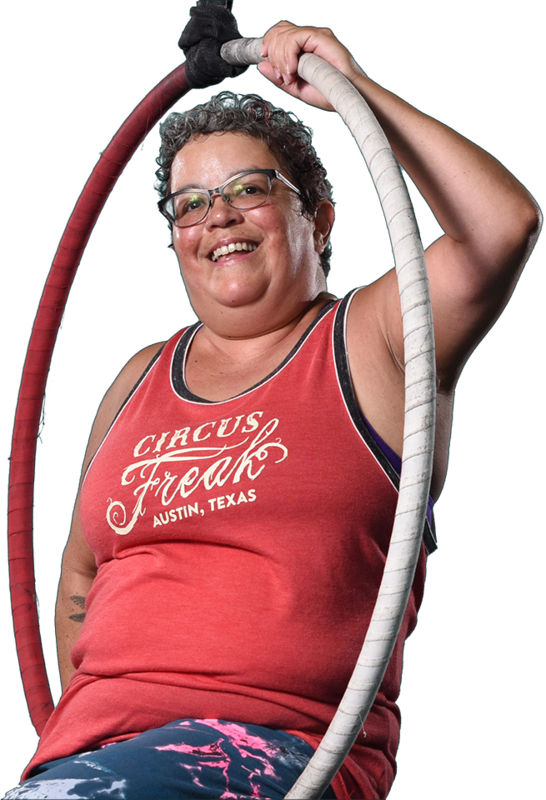 With Intro to Aerials and Intro to Aerials for Plus Size Bodies, spend a little time with some of our most popular apparatuses, then pick a favorite (or more!) to pursue further. With Intro to Pole, we walk you through some very basic pole dancing moves and set the foundation for our Pole 1 Series. Absolute beginners welcome and these classes can be taken multiple times! Intro to Aerials is for adults only (that means ages 13 and up.) Kids who have successfully completed kindergarten-age 12 are welcome in our Youth classes. “I realized I had no reason to feel uncomfortable here." You’ve decided the circus is the place for you – so, what’s the best way to really dive in? We highly recommend an Intro Series to get familiar with your apparatus family: Silks and Hammock or Trapeze and Lyra. Series classes meet once a week for four weeks, so basic skills and body positions are regularly reviewed and new vocabulary is introduced and built upon as you progress. “Sky Candy is there to keep me grounded (only figuratively)." Are you a future silks star or more of a lyra lover? Our interactive quiz will guide you towards the best starting point for you! “Sky Candy has had a life-changing impact on me." Not Sure About Trying It? While we firmly believe that circus is for everybody, only you can decide if it’s right for you. You’re welcome at Sky Candy even if you’re not ready to get in the air. Check out a ground-based class, come see a show, or participate in our public events – there are plenty of ways to be part of the Sky Candy community. Not all of our classes happen in the air. We also offer a wide variety of ground-based classes, including flexibility training, handstands, and dance. And if you’d like to focus on increasing strength and endurance, check out our fitness options! We love being in the spotlight! Sky Candy is proud to provide performance opportunities for both students and professional aerialists (often in the same show). Check out a student showcase, enjoy a night on the town with tickets to a mainstage show, or hire us for your next shindig – our performers are guaranteed to amaze and inspire! Don’t stop now! Take your training to the next level by signing up for a future series, supplementing your training with a drop-in or open studio pass, or booking one-on-one time with a Sky Candy instructor.